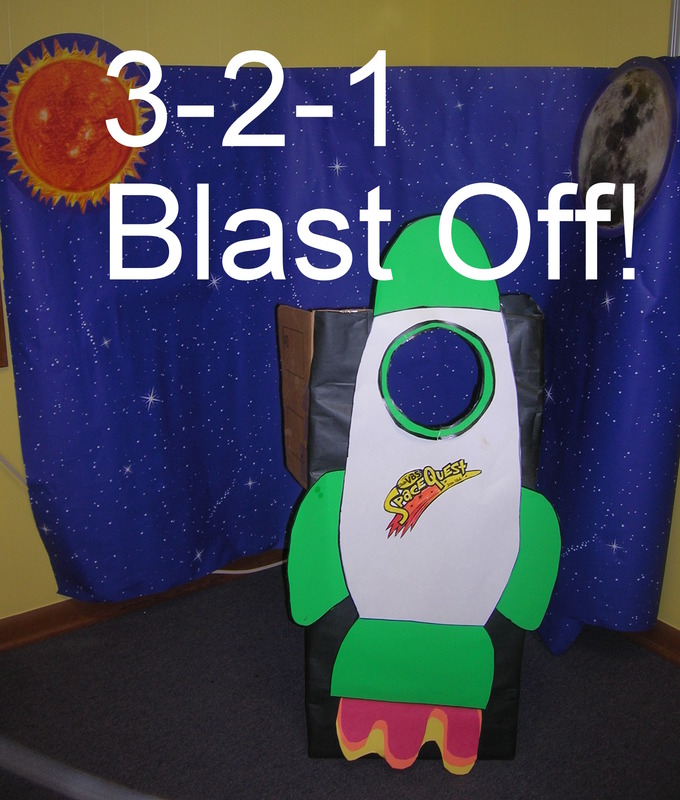 One of the themes for Vacation Bible School this year is Club VBS: SpaceQuest, an out-of-this-world experience! It was the theme we used at my church and it was such a BLAST!!! VBS got here so much quicker than I EVER expected it too – and I was totally NOT READY for it! But fortunately I am not the one in charge – God is!!! He so blessed me for the week and took care of each night – lesson, craft, games, helpers, and all. And the kids, the helpers, and even me all had a wonderful time! 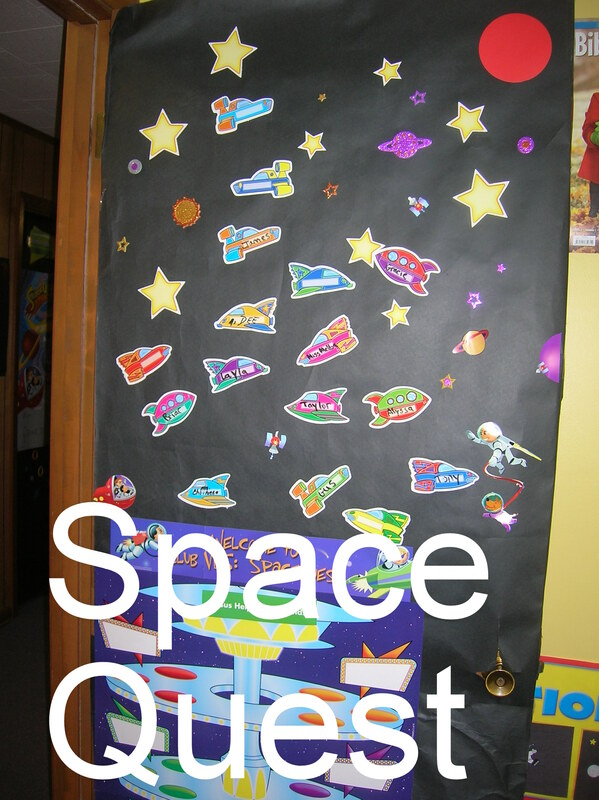 Here are my versions of the outer space decorating, activity and craft ideas I found on-line. These would make great rainy day activities or add up to a super-fantastical outer space birthday party! My “rocket ship” is a little different than the one I modeled it from. The only box I had available was not quite tall enough so I had to cut the top part-way off it off, flip it up and reinforce that part with a broken hula-hoop. Never throw ANYTHING away! I also added the SpaceQuest logo from the clip-art on LifeWay’s VBS site and put a starry night backdrop behind it. It didn’t turn out looking too terribly bad – from the front that is!!! This is so super easy, and SO fun to do! The kids really loved these. It’s also very inexpensive and would make a great party game. Instead of having the kids I taught (age 3) draw a rocket on their own I found calendar “die cuts” of rocket/space shuttles at the local teacher supply store (also a great place to find cheap room or party decorations). I also found some later at the Dollar Tree for, well, a dollar! The kids added accents to the space ships with crayons. They can also add their own “logo” to the ship either with a sticker or crayons. The “rockets” really look like they are blasting off when you launch them. If you are going to have the children draw their own rockets use white cardstock. The “rocket” will stand up better than plain paper with heavy use. Instead of using a slit in the directions I used the “hole-punch” method described in the comments and found this works GREAT! I also found astronaut calendar cut-outs which could be taking a “moon walk” instead of blasting off. I really love this craft as it is so easy to do and you can go so many ways – our solar system, random planets, moon-scape scene, etc. – AND you can use whatever materials you have on-hand to decorate it! Luckily I found a big piece of black felt in the Children’s Church Supply Closet and I had some fabric scraps from a DIY “solar system fabric book” that came in a BIG bag of fabric remnants I bought at an estate sale so this was essentially free. I cut the planets out and glued them to a felt backing with fabric glue for re-enforcement and then glued them to the felt. Be aware that the balls will not stick to the fabric planets. As I did not have all the fabric planets and wasn’t too concerned about being accurate I just glued them down randomly. I also added felt planets and stars cut from felt scraps and to add some “sparkly” added several foam outer space glitter stickers. I left off the “orbit lines” of the planets for scoring as the kids I taught are 3 years old and I really didn’t want to make it a game where you scored points. I push-pinned the game to the edge of a bulletin board and let it hang down. For “asteroids” I used Ping-Pong balls with self-adhesive backed Velcro pieces attached to them. You really, really need to use adhesive backed Velcro as you just CAN’T easily glue Velcro to plastic balls. This would also make a great “Pin the Astronaut on the Moon” game. Glue a large felt moon to black felt and then add a Velcro strip to the back of foam astronaut sticker. Add craters to the moon with darker grey felt circles. 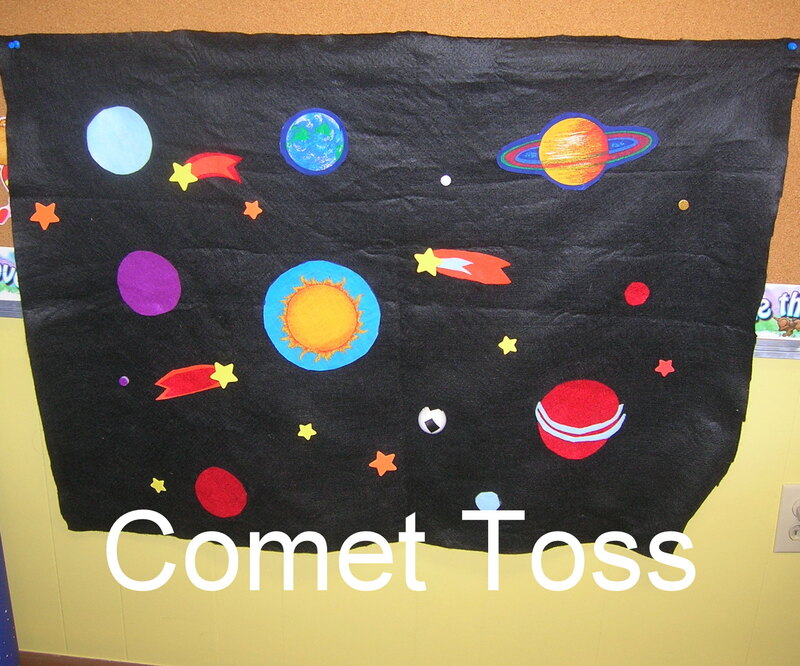 Further decorate the background with fabric paint and/or felt stars, planets, comets, etc. and of course a U.S. Flag! It could also be cute to make a super cute Outer Space Scene “rearrange-able puzzle”. 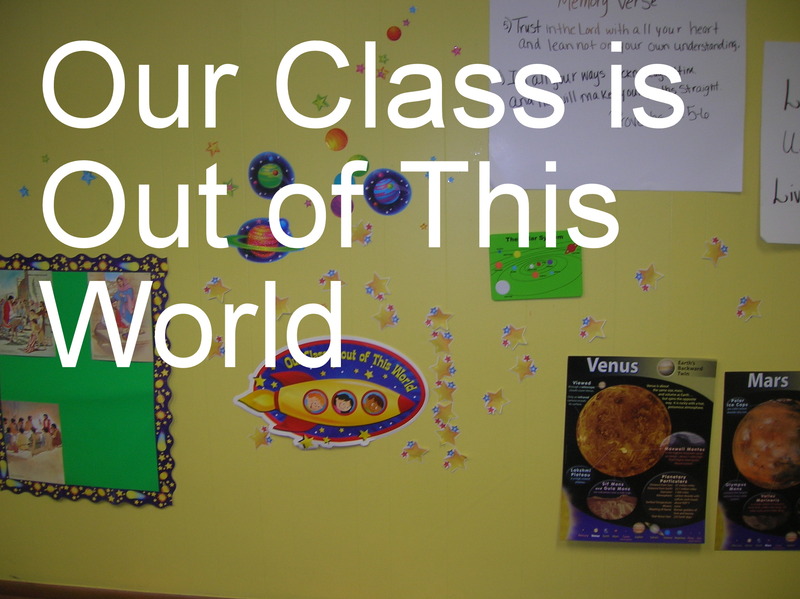 All you need is an 11”x7” inch piece of black felt and felt star, moon, comet, planet, astronaut and space ship “stickers” for the kids to rearrange. If you are particularly handy you can make a pocket for the “stickers” to reside in. Glue a piece of ribbon on the back of one side of the felt so the space scene can easily be rolled up and secured for transport. I modeled this after an Oriental Trading Company product I REALLY, REALLY wanted but just couldn’t afford. I had given up on this idea but a couple of days before VBS I found a bed canopy on sale for less than $10 at Justice. I had purchased a small glow-in-the-dark solar system model from the Dollar Tree eons ago in the event that one of my kids would need to do a Solar System project in school. I also found some glow-in-the-dark planets and stars like you would “glue” to the ceiling at you guessed it – the Dollar Tree! First I pinned them on with safety pins but that just looked “tacky” and there was the (however remotely possibility) safety issue if one of the pins snapped open and stuck one of the kids so I tried sewing them on with a needle and thread but that was taking FOREVER! So after giving up and moving on to suspending the planets from the top of the canopy some brainstorming I “sewed” them on with FISHING LINE!!! It worked perfectly and you don’t even need a needle! Someone I had put glow-in-the-dark stars on the ceiling for a previous VBS probably around 25 years ago. Can you believe they were still there? So after hanging the canopy from a hook in the ceiling I was all set for a starry night. WOW, did the kids love this! They had the best time sitting inside the canopy and counting down to blast off to see the stars – – – and listen to the Bible story. Just in case I had one child scared of the dark I got some of the battery operated push on lights shaped like stars and moons from my favorite store. They MAY have liked those more than the stars on the ceiling! This was another one of the games we played that the kids LOVED. They had a blast looking for the “hidden” moon rocks. 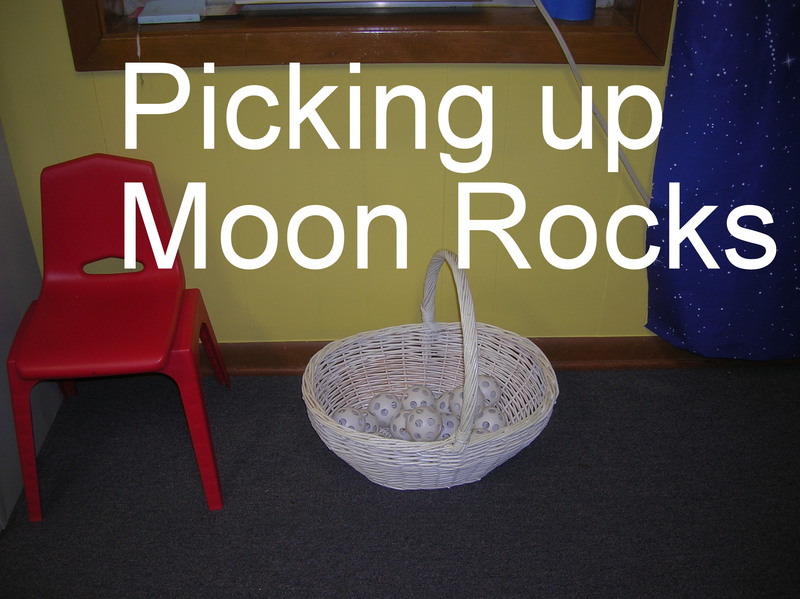 I used plastic whiffle balls but as my son pointed out moon rocks “aren’t white and don’t have holes in them – that’s pumice!” He is a little bit of a smart aleck takes after his mom! Wadded up balls of aluminum foil would work equally as well. Provide some astronaut gloves (i.e. ; adult gardening gloves or leather work gloves) and a “specimen bag” (any type of bags you can find). Be sure to have the kids do the “moon walk” (i.e. ; take big and bouncy steps)! 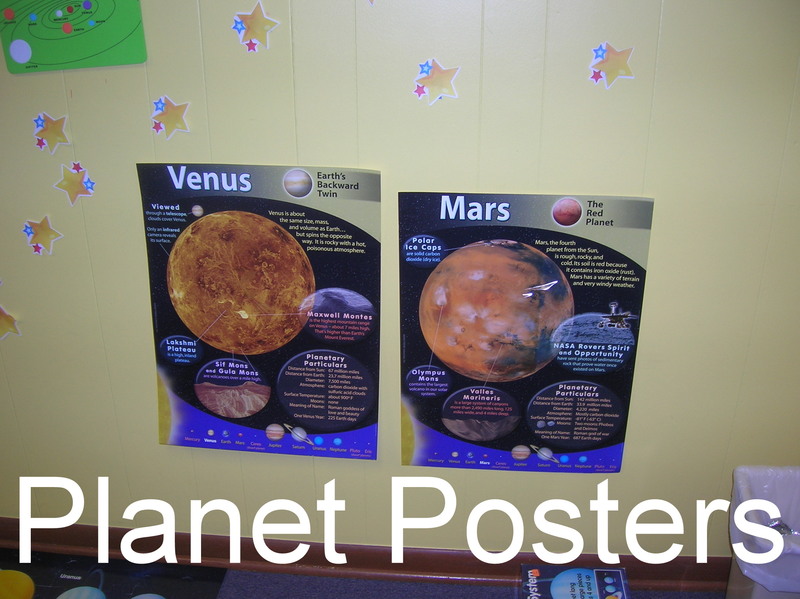 For some cheap decorations I stopped a local teacher supply store and picked up some solar system posters for a dollar each. 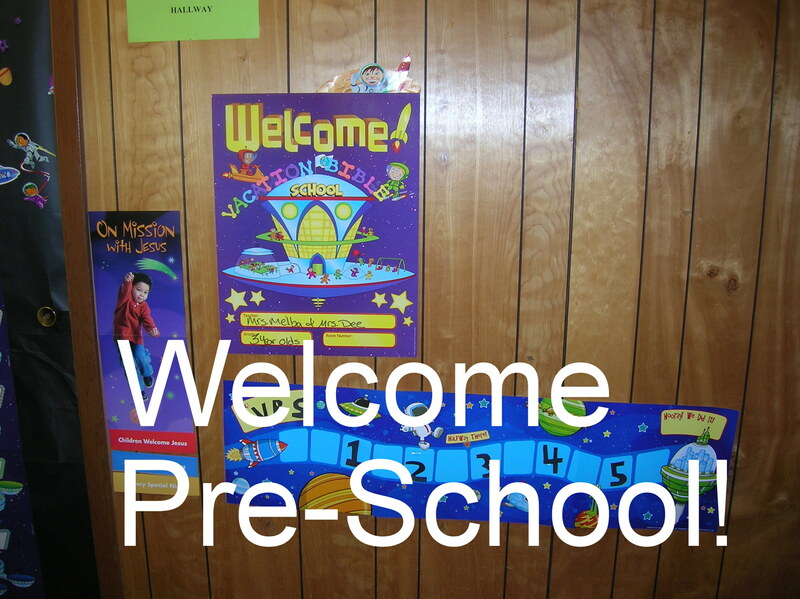 I also found some great bulletin board posters, cut-outs & borders at the Dollar Tree. 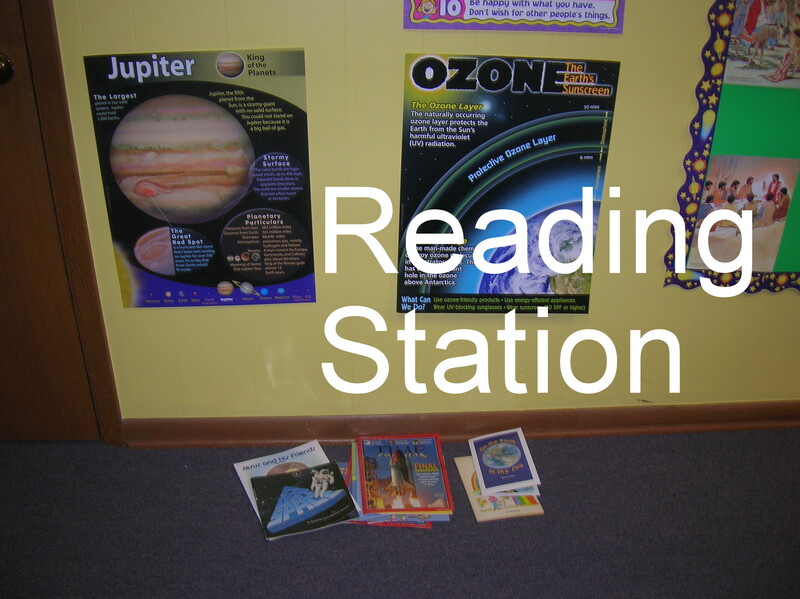 I set up the room in stations: Moon Room (Reading), Bible Dress-Up, Mission Central, etc. 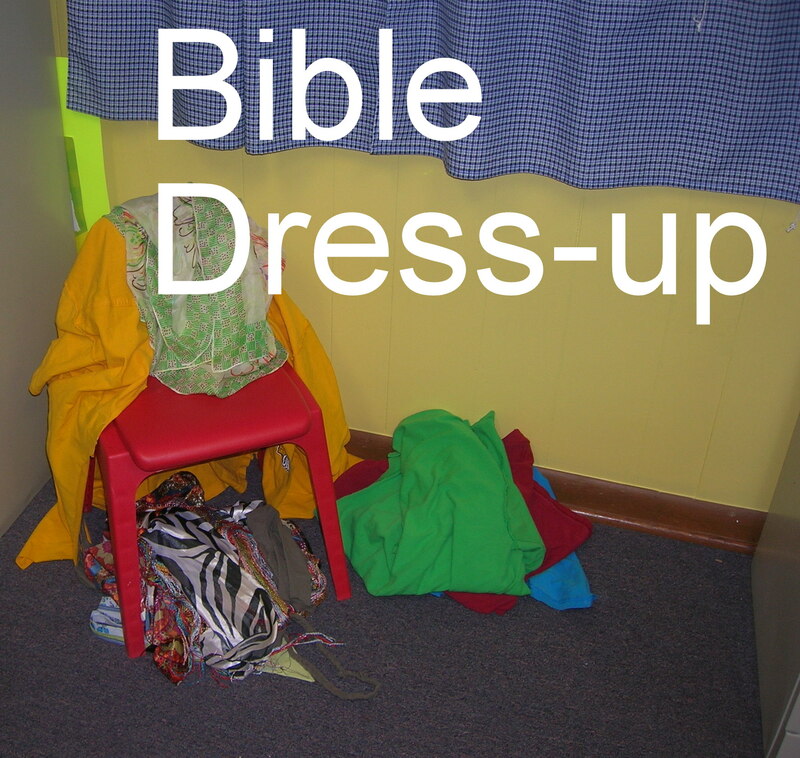 For cheap Bible dress-up clothing I asked church members for old t-shirts and scarfs. Cut the tees down the front, turn them inside out and then tie them with a fabric belt, scarf, sash, or tie. I also made some belts by braiding some torn t-shirt strips.